A The CW superhero drama, The Flash stars Grant Gustin, Candice Patton, Danielle Panabaker, Carlos Valdes, Tom Cavanagh, Jesse L. Martin, Keiynan Lonsdale, Danielle Nicolet, Hartley Sawyer, Jessica Parker Kennedy, and Chris Klein. The action-adventure series centers on police scientist Barry Allen (Gustin) who develops super speed after a dark-matter lightning strike. Behind his mask, Barry uses his powers to protect the people of Central City from many a dark force. The fifth season of The Flash is averaging a 0.63 rating in the 18-49 demographic and 1.75 million viewers. Compared to season four, that’s down by 21% in the demo and down by 21% in viewership. Find out how The Flash stacks up against other CW TV shows. On January 31, 2019, The Flash was renewed for a sixth season, with a start date TBD. Stay tuned for further updates. Will The CW cancel or renew The Flash for season six? I think it will get a renewal. 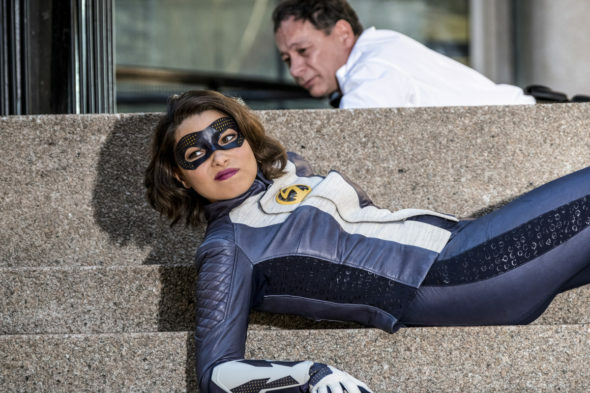 The CW has gone all-in on DC programming and while Arrow is the foundation, The Flash, which was the littlest network’s number one show for its first four years on the air, has been its superstar. For now, I’ll keep an eye on the Nielsens and update this page with breaking developments. Subscribe for free alerts on The Flash cancellation or renewal news. **1/31/2019 Status Update: The Flash has been renewed for season six on The CW. Details here. What do you think? Should The Flash TV series have been renewed for a sixth season? How many seasons do you think this CW TV show should run? RENEW! RENEW!! THIS IS A CLEAN, FUNNY, IMAGINATIVE SERIES WITH ENGAGING CHARACTERS AND SOME EXCELLENT ACTING. It just needs a good conflict/villain for season 6, and it has lots of life ahead and very devoted fans. RENEW!!! Flash needs season 6 so Reverse Flash main agin villain in Season 6 it will be cool to see how come Nora stay in touch with him if he his her dads enemy ! The Flash need a season 6 should he can fight androids with only one meta power of each android that looks likes some of the meta villains he fighted in the past ! This next season needs a meta power android thats looks like Danton Black aka Multiplex the as one of villain androids with same powers to the original meta multiplex ! Anther meta power android likes like Aaron Douglas aka Turtle with same meta power as the Turtle ! The Flash needs a season 6 They should use Liza Warner from Arrow in one of Flash season 6 episodes . The Flash needs to have 11 seasons so they can use more Icicle in next the seasons ! So can see if he will back to his old self before the intel Icicle split thing happened to him making him act different then in the past!